It was a rainy night. The night breeze dancing softly throughout the spaces. I stood in front of the bird nest. 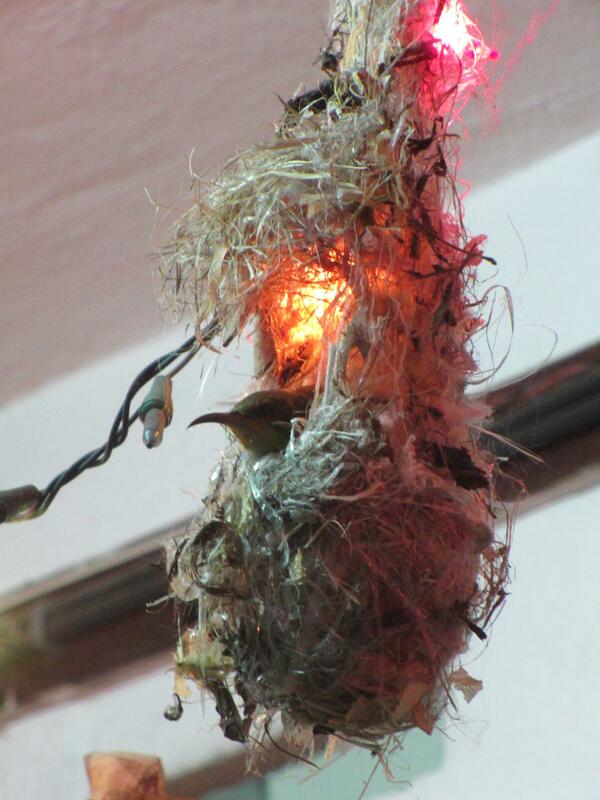 There was a tiny mother bird in the nest with her two babies. The surrounding was quiet. I stood there for more than five minutes to observe the life of this beautiful creature. They were quiet. Only sometimes, I could hear the babies were chipping with their soft tiny voices. One of the babies rested her head beside her mother. It was a beautiful scene. Whenever the breeze reached the nest, it will swing slightly to the left and right, and yet the birds didn’t show any sign of worries or panic. The mother will close her eyes and feel the breeze. She only opened when there was any movement around her. I observed them with my body and feeling but not with my mind. In silence, peace rose in me. The life of the birds was simple. In the silence and rainy night, they cuddle with love. No complaint. No worries. Only peace. First, they have helped me with my inner peace and joy. They also have helped me on healing by bring up the peace in me. The best part was they helped me strengthen up my senses as an Empath and understand energy through emotions and vibrations of sounds. They simply helped me Meditate. They have become my teachers; tiny in sizes but not in lessons. If you have problem with the usual meditation, try something like this. I meditate this way quite often. I love what the nature have for us. Sometimes it only took me 5 to 10 minutes. Just observe your nature; birds, your pets like dog or cat, caterpillar, plants or trees. Observe it with your feeling and not with your mind (to avoid judgement and analyze). Observe it in silence as it bring out the peace in you. The peace is already there inside you and these beautiful creatures and nature can help you unleash it to the surface. And this peace can help you on healing especially emotion healing, anger, anxiety and depression. Many don’t want to talk about suicide for various fears and misconceptions that talking about this darkest of dark deeds remains misunderstood and avoided at all costs. Many also falsely believe that talking about it will actually instigate and encourage it. Nothing could be farther from the truth. By taking the ostrich approach and sticking your head in the sand pretending that hopelessness doesn’t exist you are not only avoiding the issue but you are actually aiding in making the problem worse. As a trained grief and suicide hotline counselor let me assure you that being able to provide a safe space for others to talk about their darkest fears and heaviest pressures is the very thing that will actually prevent them from giving in to their hopelessness. Yes, you can be that important to those around you, whether a stranger or a friend. However, I am not writing this article to write about suicide but to give you a flicker of hope and encourage you to be that same flicker of inspiration and hope to those around you. It’s easier and simpler than you think. One of the best ways to help the hopeless is to stop pretending that you are not affected. Take your head out of the clouds and come back to Earth and reality and realize that we are all responsible for each other. Acknowledgement and Ignorance: Everyone goes through life and at one point or another becomes hopeless to varying degrees. Especially now that the energies of the world are incredibly intense, thoughts of giving up and utter hopelessness are rampant. Ignoring this for yourself and those who try to reach out to you will not make the pressure go away. Talk about it and make yourself available to others who need to talk about it. When you know someone is in this space, acknowledge the dark space they’re in and do your best to hold a safe space for them. Judgment and Forgiveness: If you find yourself judging even this article or the woman who jumped off the 18th floor from this San Francisco apartment complex last night, then know that the energy of your judgment is exactly a part of this problem we are facing together. Judgment is what gets people to a place of hopelessness, whether it is self judgment or judgment from others. People long to know that they are enough just the way they are, that they are not judged for living, loving, choosing the things they choose and for screwing up royally from time to time. We can’t even control the hair on our very head, at least I can’t, so how then do we expect to control another human being? What futility and waste of energy. So give it up already. Instead exercise forgiveness, compassion and empathy for yourself and those around you. Plant Seeds of Blessings: Look into someone’s eyes for 3-5 seconds as you pass them by while saying “I bless you.” It works miracles, literally! Don’t shove the responsibility of blessing another human being onto God by saying “God bless you.” YOU do it! You take the responsibility of blessing those around you. Why? Because you are a manifestation and our light source flows through you as much as it flows through everyone else. So don’t hand the responsibility over to anyone else, there is no one else besides you anyway. Know with certainty that you have all the tools to bless another ones’ life. As a final note, please know that 92% of all people who commit suicide do have some type of chemical imbalance and/or are taking some type of medication. If you feel suicidal please call 1-800-SUICIDE or work with your therapist to get the help you need. Make sure that you take care of your brain by giving it the Omega 3s and other nutrition that it needs to operate at its best. Note: Thank you Dr. Cha~zay for the nicely written article and for the permission given to re-post the article in this blog. How to Increase Your Energy Before You Go To Work? Have you experience this before you go to work every morning; complaining about the stress your job is giving you and you are feeling heavy about the stress that you are going to experience it again today? If you are experiencing this, you are not alone because majority of people are experiencing it. Many people experience it for a long period of time. I did experience it many years ago when I was working in logistic company. The hectic of the job, the meetings, the demands from bosses and clients became a gang of stress to me. So I feel you and understand the stress too. But I found the solutions. Before we get to the solutions, you must first understand what is keeping you running on the same stress and hardly break the chain between you and the stress? The answer is you choose to go to work when your energy is in low vibration. You get the low vibration by thinking the things that already pulling your energy down like the stress, the demands, the arguments, the meetings, the datelines and more. The solution is not about eliminating all the stress and the source of the stress but to prepare you on energy level and increase your vibration before you face another (or same) stress at your work today. When you face the stress with higher vibrations, you are controlling the stress entirely. Most important thing is the stress has no power over you anymore. The tips is for those who feel they have no enough time to live their morning peaceful life. Before you start the car’s engine and heading to your office, spend 5-10 minutes facing the Sun. The best time is when the sun just rose, the colors of the Sun are between orange to yellow and the heat is cozy warmth. Sunlight increase energy level in you. Sunlight generates Vitamin D for your skin. During sunbathing the morning light, close your eyes and think nothing. Put aside all the meetings and works you have in your mind. Remember you still have another 7-8 hours to think about your work, so quiet the thoughts for 5-10 minutes won’t do you any harm. In the process, take few deep breaths and feel the morning breeze. Let the energy and the peaceful life flow in you beautifully. What I mean by ‘touch the nature’ is connect yourself and your body with the nature by touching them. Here are few simple tips for you; stand barefoot on the soil or touch your plants. Speak your love to them silently and their love will be with you the entire day. All the elements that come from the Earth contain healing energy for you. You need it in overcome the stress later on. I am power of love. I am power of peace. I am power of harmony and I claim all the power of me. All my works are within my control. I cherish all of it with joy and love. Throughout the day, these powers become yours. And when stress is visiting you, it has no power over you. When you realize it, you will know how to use the stress and turn it as a force in achieving your goals and works. 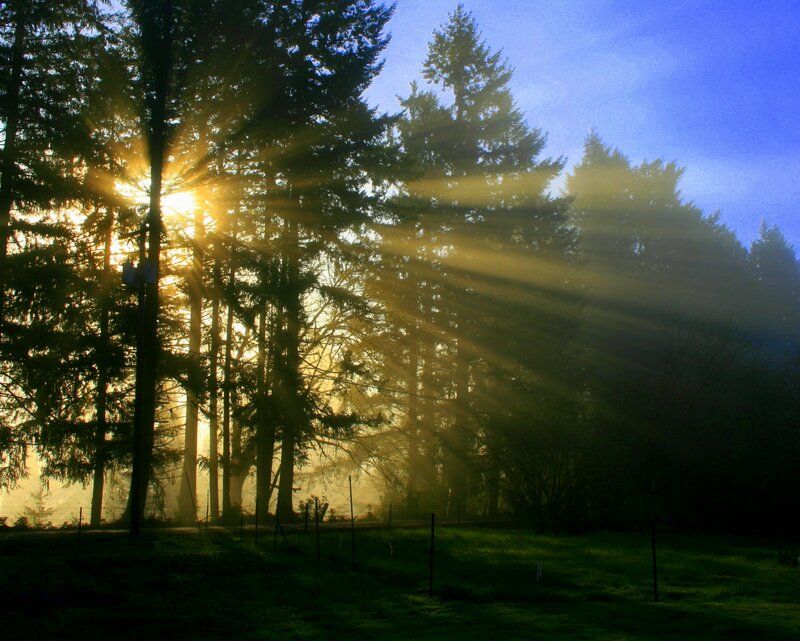 Morning sunlight bring peace in you. If you are an empath, feel the peace from the picture. Law of Attraction simple rules: Your action must not contradict your desire. If your desire is to be healthy again, therefore, in every action you make; you must avoid the opposite acts of health. Here are the few simple examples. Sometimes we are tempted to speak of the illness to others for many reasons. One of the common reasons is seeking understanding from people around us. However, if you have to speak of your illness, speak only one and that’s it. Practise ‘no repetition’ in explaining your illness to others. The reason is; when you speak of your illness, you are giving your attention and focus to your illness. The energy and vibration that you put on your illness plus what others may have for you (like sympathy, sadness) only contributes more power towards your illness. Tips: Speak only about health. If you need to speak about your illness and how bad it has ruined your life and your motivation, find a right person to talk too. By all means, find a person who will not help you contribute more unnecessary energy towards your illness. This may sound a little weird but this is how many people feed their illness and help it growth unintentionally. Any habit that opposite from the health must be avoided. If you are a smoker, try to quit smoking. If you are an alcohol drinker, drink lesser or quit drinking. If you a person who like to sleep till the afternoon, change the habit to wake up early in the morning because morning life unfold countless healing for you. Tips: For smoker who wanting to stop smoking; advisable is not to quit cold turkey. Instead reduce the cigarette intake on daily basis. The most important thing is every effort counts. Small effort counts too. Giving up will unfolds all the opposite energies of healing and health. 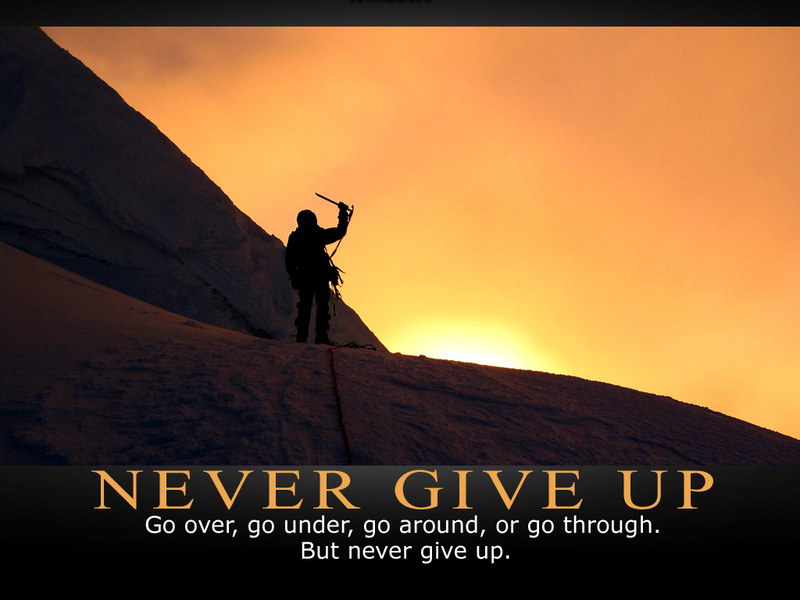 A person who gives up will start to eat unhealthy, do unhealthy activities, live unhealthy habits and many more. Give up is the biggest switch that turn off your health and any healing on you. Avoid give up at any costs and give love for your health no matter what. Tips: When you started to feel give up, please talk to the people who can light up your courage again. Most of the time, give up just play games of emotions with you. So it is important to channel the energy into love and bring back the courage in you. Healing illness is not entirely about focus on the illness and find ways to kill it or cleanse it out from out body. Healing illness is about transforming from the state of illness into state of health. These days, many people who fall into illness state craves for healing. When they get the healing, they tend to stay there and hoping that illness will never return. 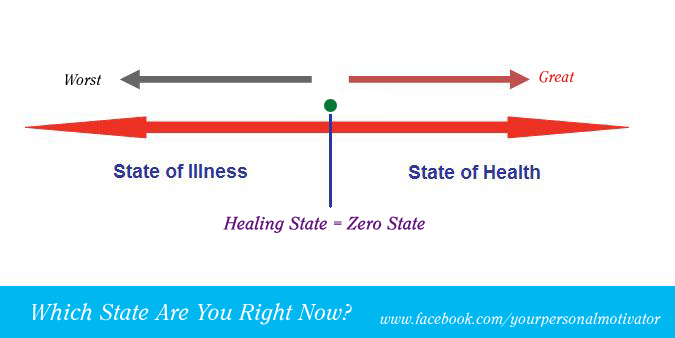 Given the chart below, healing state is a zero state (The Green Dot). In this state, illness healed but the risk to fall into the left side of the grid is there. You can stay healthy by staying on the right side of the grid. To move towards the right side, you must have efforts to stay healthy. What are the efforts? Here are the three important lists (read here for more tips). The biggest contribution towards a healthy lifestyle. You have to change your eating habit. Go for balance diet. Eat when you are hungry and stop before you are too full. Eat in small portion. Take lots of vegetables. Forget junk foods. Never eat after 7pm. Pick any exercises that suits your need; Yoga. Walking. Cycling – indoor or outdoor. Jogging. Swimming . Hiking. Pilates. Dancing. Anything that makes you sweat regularly. Tips: Always start small. The most important part in exercise is persistence. When I was working in manufacturing line, there were times I had to work entire night. What happened was a week later, I would felt weak. I had habit stay up late night many years ago and it has affected my health badly. If you are person who loves to stay up late night, change the habit for good. The best hour to go to bed is 10pm (the earliest). In between 10pm to 2am, body is working their wonders to rejuvenate. Skin turns healthier too. Sleep for 6 to 8 hours depends on the body and mind. Wake up early in the morning for freshness air and feeling. It is challenging tasks and I will not deny this. It requires a long list of works need to be done from time to time but the rewards are priceless. After all, if to stay healthy is what you need, do you have a choice? The hard works and the challenges are rewarding, so why not give it a try? Have you ever accidentally cut your finger with knife or got scratches when you fall down on your knee? Does the wound heal by itself? It does. With right amount of time and treatment, it always does. In healing illness, it is important that you trust your own body that they are working on healing 247. Besides trust, it is advisable that you support the healing by acknowledge the pain with love and less in complaining or whining about the pain. Give right treatments with right medications to your body and the universe inside you just knows what to do. Bottom line is, as long you want to be healed; they will do their best to heal too. 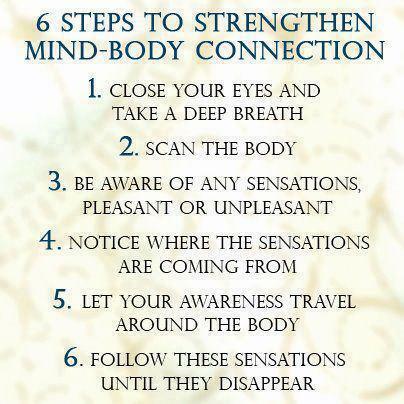 Tips: Check out the photo below and learn how to connect with your body. This way, you can feel the pain at the exact point of your body. With the acknowledgement of the pain, it is easy for you to focus on the healing. Most of the time, in the process of healing illness, you need secondary party like healers, medical practitioners and medicines to help you healing. These parties have what you need to heal from illness. However, whether their healing is effective on you or otherwise is depends on your belief and TRUST. First of all, when you seek healing from secondary parties, you must extend your beliefs in healing to these parties too. It also means, you must belief that their works of healing are effective to you. Second of all, trust is like a bridge that connects the healing from the secondary party and you. Your body has a powerful defence system and they work under ‘instruction’ of your mind. Without trust, your body will do anything to reject the healing or didn’t take the healing at all. In Reiki and also in many other healing techniques, healing that goes without trust will be dismissed or repelled. Trust must be developed inside your heart and it should be given out by verbal permission like “I give you permission to heal me”. 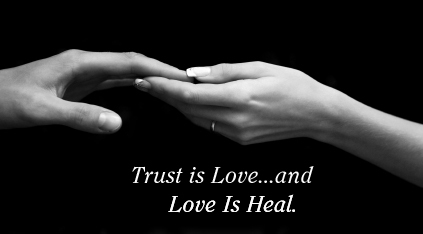 And trust is one way to love. Tips: Take time to know your healer. Then, be honest with your own self and the healers. If you have no trust, it is okay to inform them that you may not need the healing at this moment. Don’t just take the words ‘I can heal’ as words of convincing but turn it into a belief too. BELIEF is a powerful force in human life. It works with subconscious mind. Subconscious mind then work directly with the body, mind and emotion. It also means, you can try many techniques of healing or medications but without believing that you can heal, healing becomes impossible to your body. In part my healing treatment, I would guide my client to create a belief through powerful affirmation I create for them based on their need. 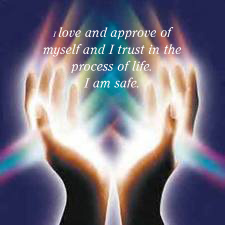 The affirmation that they affirm on daily basis will help them reprogram their belief and heal them from within. As I always mentioned to my clients that primary healing start within them and secondary healing comes from the healers and medication. So always, always heal from within. Step 2. Ask for healing and health. Ask; not a question but an appropriate request. 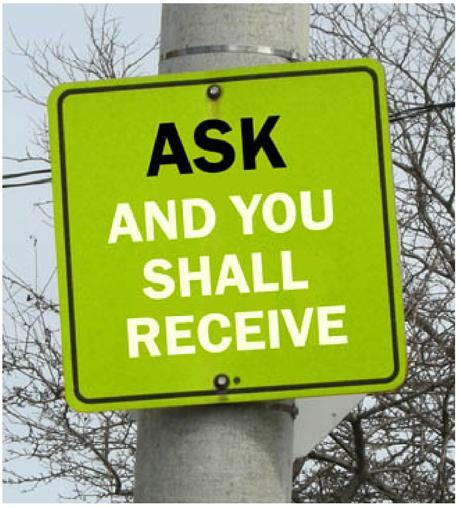 First request that you should ask is from the highest being (Allah, God or any other terms that you use). Then ask it from the healers. Last but not least, ask it from your own body. Why do we need to ask from these three beings? The answer is simple. Only God can grant the healing and health. Healers can’t give you any form healing if you didn’t ask for it. If they do, it gets rejected. Do you know that you have trillions of cells in your body? Now, all these cells have abilities to heal but their work of healing based on your efforts too. These trillions of cells must know what you want and what you are going to get. Simply ask them to work in harmony with you. In return they shall work wonder. It is also a simple collaboration between you entirely and what healers have to offer you. Ask for it because without asking for it, no one will know what your needs is. Furthermore, to ask is polite. It is a promise to us, ask and you shall receive. Have you ever wonder why after you have tried many healing techniques and medicines but you still stuck with the illness? In pursuing healing, the most important thing is the focus you have on the healing itself and not on the illness. To heal, you must do many things and leave many other things too. I’m not just referring to your body but also your mind, emotion, soul and your lifestyle. The fact is you can try as many healing techniques or medicines in the world but whether it is works on you or otherwise, it all depends on YOU. For the next few days, I will share with you practical steps and criteria you can focus and improve in order to help your body heal faster. Let’s start with the most powerful ones. The most and foremost point of all, you must want to be healed and you must crave deeply for good health again. There are two points here; heal and health (now that you know why I have the word COMPLETE in the title). 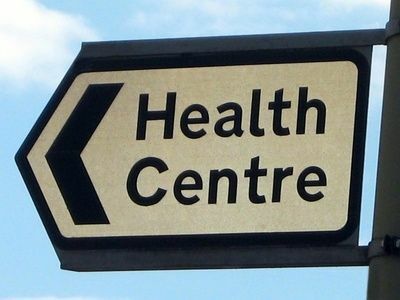 Heal and health comes together but they walk separately. If you have desire only on the healing but you doesn’t care on the health, your healing is going to work slower. Here are differences between heal and health. To heal involves many parties and efforts like healers, medicines, treatments and so forth, whereas to improve health requires your own efforts only. Desire to heal comes from the emotion and mind, whereas health involves action. To have both give balance in your healing. So it is always advisable that you work on both of these areas. *If you require healing (not just physical healing but non-physical too), please contact me via email for further information. Mean time, stay healthy and stay love.